The Allies have lost the war and Hitler and Hirohito rules Europe and Asia. When Yael and her mother stepped off that horrid train car, Yael was selected by the Angel of Death to undergo horrible experiments for the Aryan empire. Fast forward to the present, Yael is no longer the scared little girl but a fighter who can not only change her face in the blink of the night, but she is the final hope for the Resistance to bring Hitler down once and for all. The million dollar question is: how will she able to carry out her mission as Hitler is untouchable? 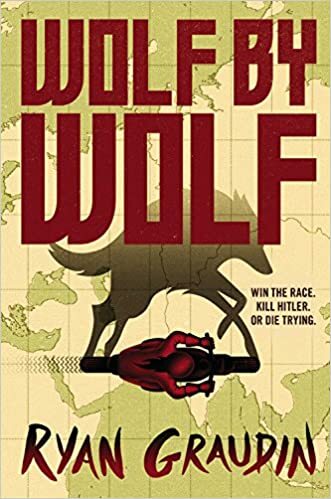 The answer: assuming Adele Wolfe's identity and compete in the Axis Motorcycle Tournament where she will ride across the continent to travel to the castle of the Emperor and meet Hitler. The only problem with this plan is not only does Yael have to assume Adele's identity, she has to outwit Adele's twin brother, Felix, and rival, Luka. What Yael doesn't realize is that there is quite a bit of information that are not in Henrikah's files and Yael must improvise or get caught. For Yael, failure is not an option and she will do whatever is necessary to complete her mission. WOWOWOWOWOWOWOWOW! This is such an amazing story that I couldn't put it down! What makes this story unforgettable is that it tackles the question: what if Europe and the US lost WWII. As awful as it sounds, the hope for this world rests on the shoulders of a young woman who suffered so much at the hands of the Nazis. Along with his extreme hatred for the Jews, Hitler was obsessed with the perfection of the Aryan race, which resulted in unethical human experimentation. I thought it was brilliant of the author to use skin shifting as the result of the experimenting because it became an asset that only Yael could possess. In other words, Graudin turned the evil that was Hitler into something strong and brave--Yael. Along with Yael, Luka and Felix have a tremendous effect on her as they reveal intimate details about Adele, which not only reveals Adele's character, but it also forces Yael to re-evaluate who she is and what she wants. The ending will send readers over the edge and craving for the next installment. I was born and raised by the sea in Charleston, South Carolina. I grew up on a steady diet of fairytales, salt-marshes, music and brothers who would reenact Redwall battles with me in the backyard. I went to an artsy sort of high school that allowed cello recitals in the hallways and impromptu poetry slams in the cafeteria. It was there I decided that writing was what I wanted to do more than anything. So I wrote. I went to the College of Charleston and graduated in 2009 with a degree in Creative Writing. I met the love of my life and got married at 21. We started traveling the world together and never really stopped. We’ve taught English in South Korea, farmed in New Zealand, hiked through Peru, spied on lions in Kenya. Country number 20 is next on the docket. I still live close to the sea, with my husband and my wolf-dog. We try to grow gardens, but haven’t had much success. Sometimes I get bored and color my hair or pierce my nose. One day I’ll be brave enough to commit to a tattoo. Cath has always dreamed of owning her own bakery, but, as a lady, becoming a business woman is not an option. In fact, her only option, according to her mother. is to become Queen of Hearts and that is the last thing she wants. Although the King of Hearts is the the sweetest person around, there is no way Cath could ever fall in love with someone who bounces when the giggle. However, at the night of the ball, Cath and the entire kingdom met the new royal jester who not only stole show, but her heart as well. What started out as an inadvertent rescue attempt from an impending proposal from the king (and a super tight corset), Cath fell hard for the mysterious Jest. While trying to evade the King, and make her dream come true, Cath doesn't know what to do or who to trust. Meanwhile, there's a Jabberwocky on the loose and the people are concerned as it's been centuries since a Jabberwock has been seen around the land of Hearts. With each adventure, and mishap, Cath and Jest's attraction rapidly grows and, when the unthinkable happens, readers will know why the next Queen of Hearts demands that heads roll. Marissa Meyer has done it again! Not only has she taken a beloved story and made it her own, she finally gives us the story we have all been dying for: the story of the Queen of Hearts. I will confess that this story not only me falling in love with "Alice in Wonderland" all over again, but the characters were my absolute fave. Cath is definitely my kind of gal as I identify with her in many ways. For most of us, we all have experienced, or will experience, deep loss. However, we all choose to handle our losses and grief in different ways and, for Cath, her grief turns to vengeance and, ultimately, destroyed the sweet girl that her family and friends loved. This story is a story about love and not a love story as the ending will have readers in tears and craving revenge as well. Very well written and I can't wait to see what Marissa will write next! After losing her mother unexpectedly, Jessie's father remarried, sold their home in Chicago, and moved them across country to live with Rachel and Theo, her new family. Although Rachel, her father's new wife, is trying to make things work, Theo, her stepbrother, isn't having any of it and ignores Jessie even on her first day of school. What was a tough day, it gets even stranger when she gets an email from a person named "Somebody Nobody" offering her advice on how to navigate Wood Valley High School and who to avoid. Although Jessie isn't sure why this person would want to help her, she trusts this stranger and they develop a rather peculiar and sweet friendship. Although SN (Somebody Nobody) wants to remain anonymous, Jessie is also creating new friendships of her own and even catches the eye of super popular, Ethan. However, Jessie is also on the radar of Gem and Crystal who are not only the most popular girls in school, but also the meanest. Despite having to start over again, Jessie tries to keep a low profile, and out of Rachel's house, so she decides to look for a part-time job. Ironically, the book store she works in is owned by the parents of another super popular boy named Liam, who will eventually cause Jessie a whole new set of problems. Miles away from Scarlet (her best friend), and distant from her father, the only person Jessie can rely is SN, but who is SN and why do they care so much about her. In this funny and poignant story, Jessie is forced to deal with her grief while trying to start all over again one day at a time. I can honestly say I didn't expect a lot from this book, but WOW was I surprised. Jessie, unfortunately, was hit with way too much stuff that no human being should ever have to face at sixteen years old. What was even more aggravating is that her father thought it was in her best interest to start all over again in a different state without even asking her. Although the same could be said for Rachel, Theo's mom, what readers need to realize is that grief can make people do things that aren't always rational, but, at the same time, Rachel and Jessie's father, needed each other in order to cope with their loss. 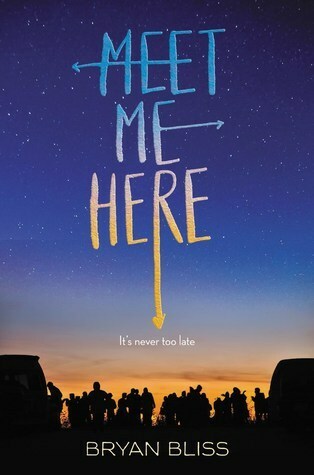 What this book does so well is teach us how debilitating and ugly grief can be when we lose someone we love, but, at the same time, shows us the beauty of hope, forgiveness, and love. I can honestly say that I thought the SN/Jessie conversations were a little creepy at first, I eventually learned to love them because SN became someone that Jessie could rely on when she needed someone to listen. I think all of us need an SN because we sometimes need someone to help us forget our problems and just talk. Although SN identity was a little on the predictable side, once you get half way through the book, I am glad the author didn't throw us for a loop and I LOVED the last line of " But sometimes a kiss not a kiss is not a kiss. Sometimes it's poetry." "Three Things about this novel: 1. I loved it. 2. No, really, I LOVED it. 3. I wish I could tell every teen to read it. Buxbaum's book sounds, reads, breathes, worries, and soars like real adolescents do." - Jodi Picoult, NYT bestselling author of LEAVING TIME and OFF THE PAGE. Last year, on October 15th, Morgan's life changed forever. Rather than attending class and hanging out with friends, Morgan doesn't leave her apartment...ever. When Morgan has a bad day, she tries to follow the three-steps, but, sometimes, she needs an emergency pill. Although Morgan's family understands why she is feeling the way she does, Morgan has no idea if, and when, she will get better. What was supposed to be a day of online classes, television, and a grilled cheese sandwich and tomato soup, Morgan looks at the window and she sees Evan. Not only is Evan gorgeous, he is her new neighbor. It's been a long time since Morgan has ever felt this way so when he knocked on her door, nothing was ever going to be the same because he reminds her of everything she misses dearly. The only way Morgan is ever going to get her life is to have the courage to step out the front door and finally face the past that has haunted and crippled her. What happened last year? What will happen if Morgan shuts the door on Evan? In this amazing debut, Marisa Reichardt brilliantly describes the fragility of the human psyche and how courage, and love, can help us find the strength to move on. As stated, previously, this is a wonderful book that gives readers insight on trauma-induced anxiety. Without giving the book away, Morgan is suffering from a type of mental illness that cripples hundreds and thousands of people and it is NOTHING to be ashamed of. What I appreciate the most about this book is how the author depicts the process of overcoming mental illness through her therapy sessions with Brenda, her mother and brother, and the way that she grapples with her father's Post Traumatic Stress Disorder (PTSD). Like anxiety, PTSD is a horrendous disease that plagues veterans is a result of seeing, hearing, and dealing with so much stress that the brain literally malfunctions and the person is just unable to deal with every day life. Although Morgan and her father experienced horrible things, their illnesses are treatable with time and medical treatment. As a person who lives with mental illness, I appreciate the author's narrative as it describes the process of recovering from a mental illness. It's incredibly important for reader's to understand that recovering from mental illness can't be fixed with a pill or just a few therapy sessions. For Morgan, Evan was the missing piece she needed in order to step outside her front door, get back into her car, and go back into the water she loved so much. This is a great book for teens who are not only experiencing mental illness, but for teens who may know someone they love or care about. Marisa Reichardt is a SoCal native who has paid the bills by shucking oysters, waiting tables, peddling swimwear, tutoring, and writing. She currently lives in Los Angeles with her family and can usually be found huddled over her laptop in coffeehouses or swimming in the ocean. She has a Master of Professional Writing degree from the University of Southern California and dual undergraduate degrees in literature and creative writing from UC San Diego. 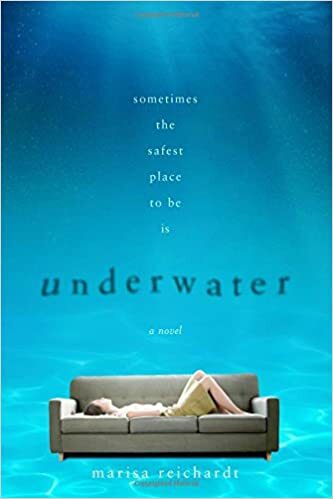 Her debut novel, Underwater, was an Indies Introduce New Voices pick for winter/spring 2016 and an Indie Next Top 10 pick for winter 2016. After the bathroom incident at her last school, Amanda has to decided to move in with her father and start over. Life for Amanda hasn't been easy because she has had to bury a secret that almost cost her her own life. Now that she has decided to not hide who she is, Amanda must pick up the pieces from her former to life in order to start anew. Although she and her father haven't really spoken since the divorce, he is trying to make amends for the fact that her father wasn't there at the hospital he refused to acknowledge the fact that Amanda was different. Apart from her mom and her best friend, Virginia, Amanda has to tread lightly with who she befriends for fear her secret would come out. Luckily, Amanda has managed to not only keep her secret a secret, she made news friends on the first day of school, which ave her hope that she could live a normal life. However, Amanda has decided to throw caution to the wind after meeting, and getting to know, Grant. Not only is Grant gorgeous, but there is something genuine and kind that Amanda can't get enough of. So what if she is hiding something because Grant has given her the chance to start over and, for the first time ever, be loved for who she is and not who she used to be. This is heart wrenching story of a girl who has split blood, tears, and suffered years of agony to be who she wants to be and finally realized that she deserves to be loved and to love in return. You definitely, absolutely should not be shy about contacting her, even if it's just to talk. She's always open to new opportunities and chances to speak with new people. "If there's any justice in the world, we're all witnessing a YA powerhouse in the making." When Em woke up in complete darkness, she had no idea where she was or who she was. When she tried to move, something was holding her down and something was trying to hurt her. After fighting the darkness, Em emerged from her trap to an empty room and no idea where to go. What was worse, she noticed other "coffins" liker hers and that is when she heard the screams from the other coffin. After rescuing a girl who happens to have the same birthday as Em, they leave their room to stumble upon other coffins. Not knowing what to do, or where to go, Em tries to rescue other teens who may be laying in the coffins, which gets her nominated to becoming the leader of their group. As Em leads this small band of survivors through their concrete prison, Em and her teammates are being hit with flashbacks and memories from their previous lives, which means that somebody has to be looking for them or missing them. The only thing the group can't figure out is that all of them claim to be twelve years old, but, when they look at each other, they see bodies and faces of young adults and not children. Why would their parents leave them all alone? What exactly happened to them that would leave them abandoned in a tomb filled with dust and bone. As Em and the others explore this maze, not only do they learn that they are not alone, but their escape becomes more complicated and even more dangerous. Readers will not be able to put this book down and the end will leave them starving for more. Per the author's request, which I completely respect, I will not divulge any major plot points as to not spoil the story for potential readers. I will instead comment on just how much I LOVED THIS BOOK! OMG! All I can say is that Scott Sigler has given us a gift because it conveys the ultimate power that is the Science Fiction genre. Compared to traditional Sci Fi stories, authors are adding another dimension to the character development that not only makes them accessible to non sci-fi readers, it makes the characters that much more human, which, in this genre, can be a good thing and a terrible thing. I had no idea whatsoever to expect from this story so I highly recommend that readers do not go into this book with expectations. If readers do, this will story will destroy those expectations for the better. I am actually going to be discussing this book with a bunch of teens so I am totally stoked to hear their thoughts and how they can relate to this story. I am going to pick up the sequel, Alight, and I can't wait to return to the crazy world that Em and friends are trying navigate and I am looking forward to their adventures. It's graduation night and Thomas' bags are packed and ready for boot camp. Like his father and his brother, Thomas is fulfilling his duty by joining the United State Army. The problem is that he doesn't want to go because he doesn't want to end up like his brother Jake. When Jake returned from Afghanistan, everyone greeted him with a hero's welcome. However, Jake isn't the courageous hero that everyone thinks he is. In fact, Jake is a ghost who hardly says a word, doesn't take care of himself, and always carries around a mysterious black backpack According to Thomas, Jake will never be the same and his parents refuse to recognize that he is a broken man. Before going to war, Thomas worshiped his brother and was excited to follow in his footsteps. Now, all Thomas can think about is running away and never looking back until Mallory backhands her boyfriend at the party they are at. Thomas and Mallory haven't spoken in two years and when she asks him for a ride home, Thomas reluctantly agrees. What should have been an easy trip turns into a highway pursuit that will kick start a series of events that will take him all over town that will eventually lead him back to why he and Mallory lost touch and uncover the demons that have been haunting Jake. In this riveting story about a teen who just wants some normalcy, he will finally break down the walls that have been separating him from his family and Mallory, which is anything by normal. I was unbelievably impressed with this story. I literally blew through this book in one night and I can't express how important this subject matter is given today's political climate. Post Traumatic Stress Disorder (PTSD) and Combat Stress are, categorically, the most detrimental mental illness' that plague the men and women in the armed forces.One thing readers will learn is that mental illness does not effect just the person experiencing the disease, it effects the family unit as well. For Thomas, he knows his brother is not well and his parents refuse to acknowledge this fact. What's worse is that his own father, a Desert Storm veteran, is the reason why Jake is not receiving the medical treatment he needs. Unlike Jake, many vets prior to 9/11 experienced PTSD, but there was never a campaign to advocate for treatment. Although Jake and Thomas' father believes that Jake will be fine when he "snaps" out of it; in reality, he will continue to deteriorate if he doesn't receive the treatment he so desperately needs. Although Jake's mental illness is the only part of the story, Thomas' fears are very real because a lot of vets are coming home broken and lost. Aside from his family problems, there's Mallory who is also in a bit of a downward spiral as well. In theory, readers will discover that both Mallory and Thomas have one thing in common: they want to run away from their problems because they are afraid. Given the events of the night, it's nice to see that they have gathered up the courage to not only confront their problems, but deal with the consequences that may follow. Bottom line: these teenagers turned into adults overnight and this story leaves readers asking "what happens next?" When people think of Parker Grant, they think she is outspoken, intelligent, and incredibly brave despite the fact that she is blind. Parker wasn't born blind, but an accident that claimed her mother's life is the reason she can no longer see. Although Parker cannot see, she chooses to wear a scarf around her eyes simply to make a statement that she may be blind, but she isn't dumb. Along with her intellect, and sharp whit, Parker is passionate about running. Whenever Parker goes running, she uses her senses to navigate the streets pretty much freaks out her aunt and most of the neighbors. Despite running the risk of literally running into things, Parker runs her heart out because it's her only chance to escape reality for a few moments. Life wasn't always easy for Parker, but, with the help of her devoted father, Parker has been able to overcome quite a few things. Unfortunately, life happened once again and Parker must now go on without her dad. Luckily for Parker, she has a group a friends who have not only been there since the accident, but have been by her side ever since her best friend betrayed her. Now a junior in high school, Parker must now face the past and not only forgive, but deal with the challenges that face her in the present and future. In this riveting coming of age story, Parker Grant must let go of all of the pain and learn how to trust and love all over again. I am beyond impressed by Eric Lindstrom's craft. Not only did I devour this book in one night, the story has been stuck in my mind for over a week. Although this story is nothing new, it is told from the point of view that a lot of us cannot begin to understand. Parker Grant is blind and it happened in accident that claimed her mother's life. Although her mother should have never been behind the wheel, stories like Parker's are not new. Furthermore, with the loss of her father, Parker has never been more alone despite the unconditional love and support from her best friend, Sarah. Furthermore, with the return of Scott, all of the pain and anger that she has been trying so hard to bury is ready to explode. 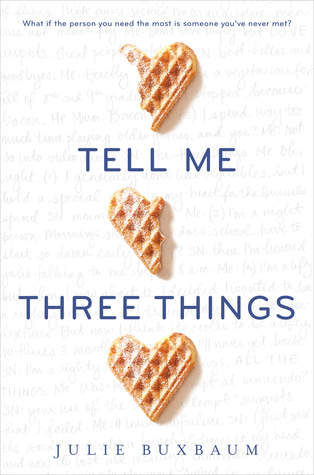 What I love the most about this story is that it's not a story about a girl with a disability, but about a regular teenager who is trying to mend a broken heart and just so happens to have a physical disability. By using her blindness as a back drop, Lindstrom conveys to readers that being blind doesn't affect a person's ability to love and feel. In fact, the only difference between a person who can see, and one who cannot, is sight. All of the characters in this story are so well done that it's not hard to love them because they represent some aspect of our own character whether we want to believe it or not. This is a beautiful debut and I can't wait to see what this author comes out with next! 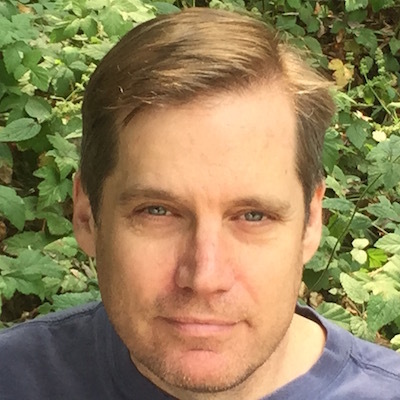 Eric Lindstrom writes Young Adult novels, including Not If I See You First, released December 2015, and the upcoming A Tragic Kind of Wonderful, coming January 2017, in English in the USA from the Poppy imprint of Little, Brown for Young Readers, and in the UK and the rest of the world from HarperCollins Children’s Books. He has worked in the interactive entertainment industry for years as a creative director, game designer, writer, and combinations of all three. As Editor and Co-Writer for Tomb Raider: Legend he received a 2006 BAFTA nomination for Best Video Game Screenplay. As the Creative Director for Tomb Raider: Underworld he received a 2009 BAFTA nomination for Best Action Adventure Video Game and a 2009 WGA nomination for Best Writing in a Video Game. He has also raised children, which led to becoming first a school volunteer, then a substitute teacher, then a part time kindergarten teacher, then getting a credential to teach elementary school, and most importantly the discovery that Young Adult books are awesome. It’s pretty much all he ever reads, and now writes, in his house near the beach on the west coast, with his wife and, yes, cats. * "Lindstrom's immersive portrayal of the dimension Parker's blindness adds to both atypical and everyday angst imbues his protagonist with mature complexity...An unflinching exploration of trust, friendship, and grief." In the final installment of The Lunar Chronicles, readers read about the life of Princess Winter, the stepdaughter of Queen Levana. While Levana scours the universe for Cinder, Winter finally learns the identity of Cinder who happens to be her blood relative. More importantly, Winter continues to communicate with Scarlet, who happens to be an ally of Cinder. In order to take down Levana, Cinder, Kai, Wolf, Cress, and Thorne devise a plan that is not only dangerous, but could result in the their deaths. In order to infiltrate the Lunar Kingdom, Kai convinces Cinder that they only way they will get close to Levana is to go through with wedding. In other words, Cinder must bring down Levana at the coronation, which is not only risky, but could seal the fates of every Lunar and Earthling. Despite the danger, Levana must be stopped because she is the key to supplying the antidote to the plague that is destroying the citizens of Earth. Meanwhile, unbeknownst to the crew, Levana is planning something even more evil and that is to not only destroy Cinder, but Winter as well. As Cinder and her crew uncover the horrors of Levana's rule, they learn the real reason behind her hatred for both Cinder and Winter. This is an epic conclusion to an amazing adventure where five young women must not only battle evil, but they must for the sake of those they love and hold most dear. I will admit that I am a huge fan. Not only is it genius to put a science fiction spin on fairy tail characters, it's even more awesome when they know how to fly space ships, hack networks, and be all around bad asses while maintaining their beautiful spirits. I was very, very happy with this conclusion because it did not end in a WEDDING! OMG! 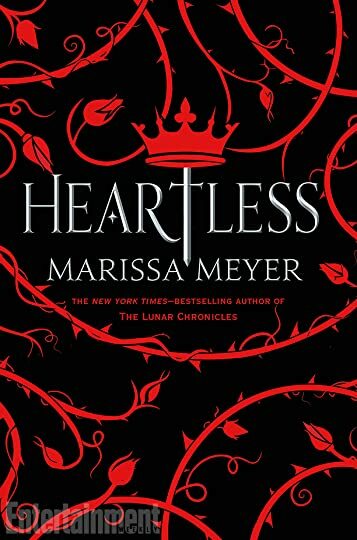 Thank you so much Marissa Meyer for providing a story for strong young women where they decide their fates, who they love, and how they will live their lives. This series will be a forever fixture on my book shelf because I want to read it with my future children where everything great in literature collide. Although Winter is not tough like Cinder or Scarlet, her strength lies in her kindness. Unlike Levana, the people love her not just for her beauty, but because of her gentle spirit. More importantly, Winter refuses to use her powers on her subjects, which is why she suffers from hallucinations. Winter literally dies a little with each episode, but she refuses to hurt her people. More importantly, her love for Jacin is so beautiful and his loyalty and love for her is so refreshing! One thing I got to had to Marissa Mayer is her ability to create beautiful couples. Although I am a huge Team Scarlet/Wolf, Team Winter/Jacin is my second favorite. All in all, this was a fantastic ending and I can't wait to read Marissa Meyer's next series! The only life Darrow has ever known is the dangerous life of a helldiver. As a helldiver, Darrow mines precious gases of Mars to help those on the surface create a world where every living creature can live on the surface. Known as the Reds, Darrow and his brothers battle the heat, flames, and pitt vipers of Mars to win a bounty of items that will benefit his clan. Although Darrow is content with his life, his father's ghost haunts him because he decided to "dance" and speak out against the the Golds; by speaking out against the Golds--you die. Although this has been going on very several hundred years, the Reds continue to what they do with no questions asked. When Darrow's wife, Eo, opens his eyes to the truth of their people, she asks him to do the impossible: create a world where their children can be free. Unfortunately, Eo pays the ultimate sacrifice that forces Darrow to make a choice: either continue living a life of servitude or fight. After being saved by the rebellion, Darrow has the opportunity to take his revenge, but ti required a lot more than dying. He literally has to change who and what he is. After infiltrating the institute that trains young Golds to become elite military leaders, Darrow not only has to work with these young men and women, he has to hide the fact that he is Red. 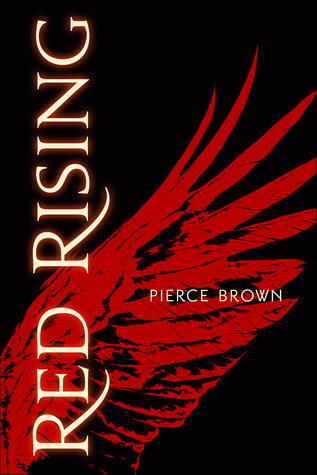 Pierce Brown has written a story that not only defies space itself, it will take readers onto a journey where blood, whatever its color, will be spilled and the corruption that that has oppressed the blood races will be exposed. As a new writer, Pierce Brown has set the bar high when it comes to amazing storytelling. Given the popularity of Dystopian fiction, Brown has created a world that is not only terrifying, but could very well be our future if we don't take care of environment and each other. Darrow's characters development is not only dramatic, but all of the trials that he had to endure have proven just how tough and tragic his character is. This story is definitely violent, but the violence portrays how this society functions. When Darrow realized that if he was going to pass his trials, he had to do one thing: conquer. If he was to complete his mission to not only be an elite military leader and savior for the Reds, he knows that he cannot let his desire to belong and be loved get in his way. What's heartbreaking is that Darrow has formed some amazing friendships with his fellows Golds, but, in the end, he has to destroy them if he wants to accomplish his mission. This story will probably try every emotion we have to not only portray the evils of humankind, but it dares to give us hope that Darrow will succeed. As Darrow progresses, it will be very difficult to see him struggle with some of the decisions he had to make for the sake of survival. Furthermore, his relationship with Mustang will pull at the heartstrings because it can only end in tears. This is a breathtaking story that will not only make your blood pressure rise, but you will be up in the late hours trying to figure out if Darrow has what it takes to succeed. In Bone Gap, Illinois there aren't any mountains or hill...there is nothing but gaps. 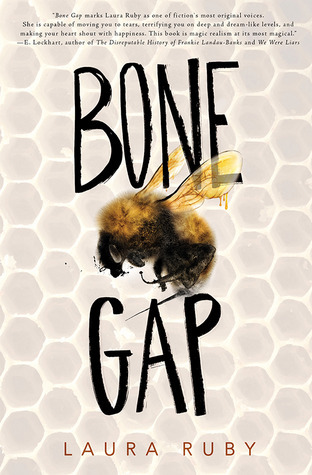 For Finn, Bone Gap is the place where his mother left him behind and trapped his older brother, Sean, forever. Finn is known as the Space Man who never looks anyone in the face. The thing about Finn is that he isn't clueless or empty-headed: he just has a hard time remembering faces. When Roza was kidnapped, Finn saw the man who took her, but, for some reason, he couldn't remember his face. Although everyone blames Finn for being unable to identify Roza's kidnapper, he never stopped looking unlike Sean. Just when he was about to lose hope, Finn sees the same man who took Roza and, when he tries tell the sheriff and Sean, no one believes him except for Petey (aka. Priscilla). Finn has had feelings for Petey for a long time, but, when the black mare mysteriously showed up in his barn, the mare finally brought him and Petey together. The problem is that Petey is the only face he remembers, which is strange because he can't remember his own face. As Petey and Finn dive into their relationship, Roza is trying desperately to escape from the man that took her, but something strange is going on because one moment she is in a house with unbreakable windows and then a castle out of a fairytale. What exactly is going on in Bone Gap where a person can be taken away in an instant and faces become unforgettable. In this riveting story where reality shifts, Finn must find Roza before it's too late. I really did not expect this story to turn out the way it did. 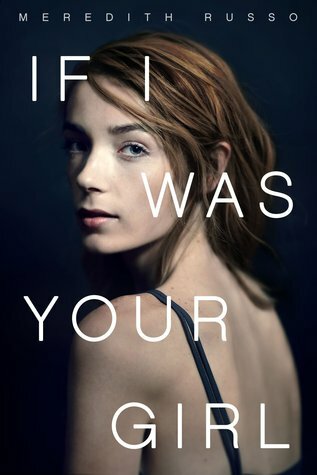 My first impression is that it's a typical young adult mystery, but it intertwines mystery, fantasy, suspense, and romance into a story where two people who were lost and found again. I really thought Finn was in love with Roza, but it's actually quite the opposite. Finn literally brought Roza into his world so it's only natural that he would be the one to bring her back home. Roza and Finn have this relationship that isn't based on romantic love, but on a different kind of love that two lost souls need to find their place in this world. As for Petey, the love that Finn feels for he isn't only genuine, but forces Petey to realize that he loves her for who she is and not what she looks like. Love is the underlying theme of this story because it was the loss of love that made Finn and Sean's mother leave, but it was the want and need for love that provided the happiness and hope that everyone needed. I really didn't know what to expect when I read this story, but I am happy I did! Mare is a Red and Reds are subservient to the Silvers. In Mare's world, if a Red does not find work he or she is conscripted into the army and sentenced to death on the battlefields. Mare is near her 18th birthday and all she can do is steal what she can to help her family. With all of her brothers in the military, the only one who has the talent to escape conscription is her younger sister Gisa. Although Mare is aware of her fate, she is biding her time with her best friend who has able to land a trade. However, when she learns that he lost his job before it began, Mare searches for someone who can help him escape conscription, but it's going to cost. While desperately searching for money to buy her best friend's freedom, she tries to steal from a stranger who, inadvertently, will become her savior, especially when the Scarlet Army strikes and Mare is captured and taken to the castle against her will. While at the castle, Mare witnesses the strength of the Silvers and, when she faces a fierce opponent, Mare releases a power she didn't know she had and neither did the royal family. In this tale of mystery, action, and romance, an ordinary girl learns that she is not only the key to changing her future, but her heart is torn in two between two boys who she can never be with. I will say that it took me a second to get into this story because the plot is similar to other stories I have read such as the Grisha Trilogy by Leigh Bardugo. Despite these similarities, I soldiered on and I finally got into the stories towards the end of the book with a plot twist that made things interesting. Since this is a trilogy, there isn't a whole lot of character development, but the villains are absolutely fantastic! The Queen and Evangeline are absolutely terrifying and awful. As for Maven, I really got attached to him so I am still holding out for him to be the hero. After finishing the story, I am a little curious to see what the next step is especially now that Shade, her elder brother, is back. Other than that, I wasn't completely blown away the story other then the fact that Silvers are almost mutant-esque and the Mare is a higher breed of mutant. I will say that there is plenty of action and the love story arch is actually a minor arc, which is nice since a lot of teen fantasy needs the love arc to attract readers. With that said, this would actually be a good title for guys and girls to read if they can get past the cover of the book. All in all, I would recommend this book to any reader who likes these types of fantasy stories. Caden Bosch is caught between two worlds. In one world, he is part of crew led by a captain obsessed with the Marinas trench (aka Challenger Deep). In the other world, he is a teenager who can't sit still and unable to shake the idea that someone is trying to kill him. Whether he is conversing with a the treasonous parrot that would do everything to overthrow the captain of the ship, or walking at all hours of the day around the neighborhood, Caden can't escape the feeling that he is trapped and has no way to escape. As Caden gets to know his fellow shipmates, he realizes that he has met these people before and, when he alienates his friends at home, he realizes that something is going on and he has to find out why everyone is abandoning him. As time goes by, the fear and the dread becomes more real especially when he is appointed cartographer by the captain AND learns that the ship, itself, is alive and wants to know everything that happens on board. The closer they get to Challenger Deep, the more treacherous the journey has become. Moreover, Caden's parents have become increasingly concerned with the fact that he hasn't been honest about his whereabouts and his overall behavior. Just when he thinks he has found a way out, Caden is suddenly captured and taken to a place he doesn't want to be. Fortunately, for Caden, this place not only helps him decipher the mystery behind his mission to Challenger Deep, but to figure out if someone is out to get him. 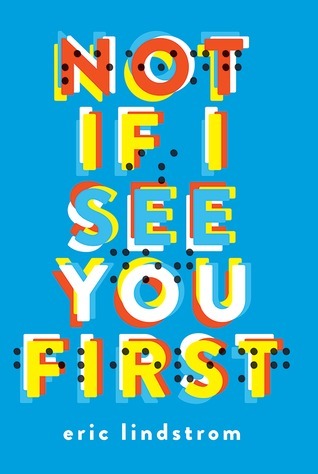 In this gripping story about one boy's struggle with his own mind, readers will see how fragile we are and how we need to recognize that certain behaviors need to be addressed in order to help those we love and care about. Bravo, Neal Schusterman for winning the 2015 National Book Award! As a librarian, youth advocate, and reader, I cannot express how necessary and needed this book is. Not only is time for a real discussion about mental illness, it is time to take a stand and help young people recognize the signs and symptoms and understand that there is no shame in asking for help. For Caden, schizophrenia is so powerful that it not only clouded his judgement, but it almost destroyed him when he decided to go down Challenger's Deep. What saved Caden is that his parents noticed how disconnected he was and decided to place him in the care of professionals who know how to treat this illness. Not only is Schusterman spot on with his descriptions of Caden's treatment, he provides three point of views that include: Caden's delusion, reality, and his family's helplessness. What most people don't realize about mental illness is that it affects not just one person, but that person's support system. As reader's read about Caden and his battle, they not only see the ugliness of mental illness, but they will also see the power of Caden's spirit, especially when soars out of Challenger Deep and back into the arms of those he loves. Anything is possible when we find the strength to overcome the darkness within us by asking, and accepting, help from those around us. 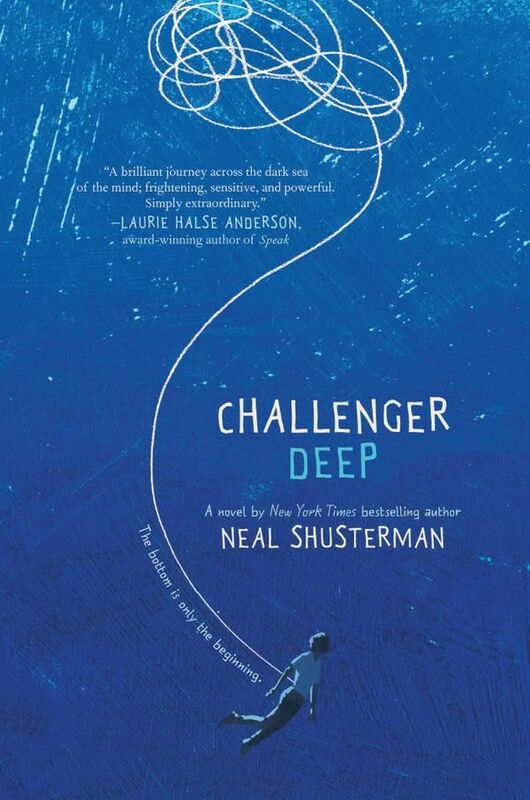 This is such a powerful story that will bring reader's to tears, but it will also provide hope that if we are stricken with mental illness we can defy the call to Challenger Deep by choosing to ignore the call. If not, knowing that we can get the help we need to by recognizing the signs and telling someone.